Home Landscape What are the Brown Spots in my Lawn? 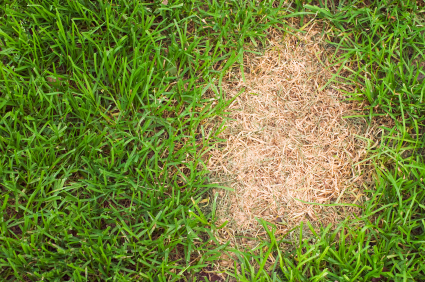 During the summer, many of our customers ask about disease in their lawns. What is disease? Disease is defined as a condition that develops as the result of a continuous interaction between a causal agent and a host plant, to the detriment of the host plant. Disease, in turf grass, is caused by living and non-living agents. Three things must be present for disease to occur in plants: The disease agent must be present, you have a susceptible grass type, and a favorable environment. All these risk factors occur in the spring and summer seasons. Therefore, brown spots occur during the spring and summer months. At Turf Fashions, we combat the disease triangle using agronomic practices throughout the year and the best fungicides on the market. Fungicides act to suppress growth of fungal pathogens. Tall fescue grass is highly susceptible to fungus in the summer. Most lawns in this area are tall fescue. Disease is very prevalent in lawns in the Piedmont area. Turf Fashions starts spraying lawns in late April and keep up treatments until September. Our treatments last twenty-eight days and be repeated at that time to ensure turf growth.